Don’t mistake this for Unity, Ubisoft Montreal’s Parisian adventure among the chattering classes – their Assassin’s Creed: Rouge, if you will. Assassin’s Creed: Rogue is an entirely different game: a Templar-told story set half a decade earlier in North America, which picks up threads dropped in Assassin’s Creed III and Black Flag. It’s where we’ll get our next ship fix. Shay Patrick Cormac is an assassin-turned-Templar with access to a big boat. As him, we’ll navigate the North Atlantic – distinguishable from the Caribbean by its icebergs. 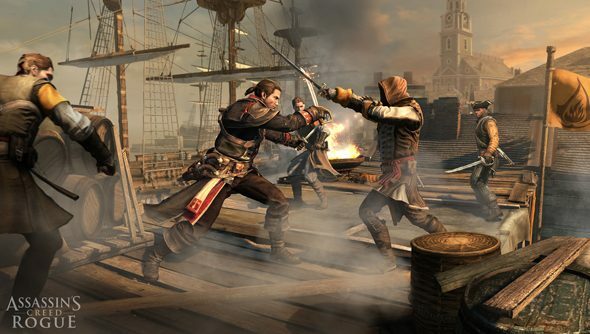 Assassin’s Creed: Rogue comes from Ubisoft Sofia, the team behind the conceptually brave Assassin’s Creed: Liberation. It picks up Shay’s story during the Seven Years’ War – the international conflict in which North America became a battleground for a French-British land dispute. That’s familiar thematic material for anybody who remembers a decent amount of Assassin’s Creed III – and Sofia have confirmed Rogue will tie up Kenway-related plot points that began in that game. New York and the Appalachian River Valley are namechecked as key locations, so expect urban building-hopping and a return to proper hunting. November 11 is being bandied about as a release date. Unity will be out a month earlier, and be the prettier game: Rogue is the rumoured last-gen entry in the well-stocked series. And incidentally, nobody’s mentioned a PC version yet. But nobody ever does to begin with, do they?